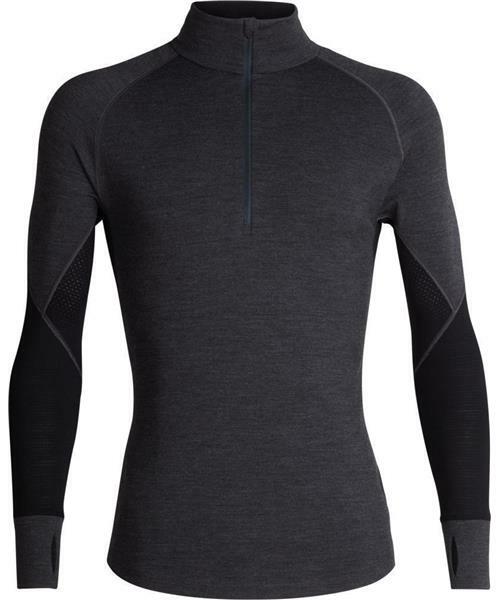 A heavyweight men’s merino wool baselayer shirt for highly aerobic days in cold conditions, the 260 Zone Long Sleeve Half Zip features zoned ventilation panels for active temperature regulation and ample breathability. 260 Zone LS Half Zip - Mens is rated 4.6 out of 5 by 8. Rated 3 out of 5 by Tallandfit from I bought the wrong size It felt great. However I’m 192 cm and 205 lbs. the L size was to short in the pants and legs. I was surprised because the model was close in height and had M.
Rated 5 out of 5 by alanjdwood1988 from Amazing base layers This is the perfect weight/thickness. Super comfy - almost wearing this one to the office everyday! Cheers Icebreaker! Rated 5 out of 5 by CSP2018 from Weathered the cold Having recently become a ski patroller volunteer, I now spend a considerable amount of time exposed to the elements. Very pleased with the comfort and full body warmth provided by BodyfitZONE top and bottoms. I've struggled in the past to stay comfortable, icebreaker 260 ZONE has made a material difference to my overall comfort. Rated 5 out of 5 by SquamishToAlberta from Northern Alberta Winter Quiver I work in northern Alberta, Canada. I spend a lot of time outside. I swear by merino base layers! My recent purchase of the bodyfitzone 260 was a great addition to my quiver. Runs a little on the big size. I’m 6’1 and 180lbs I usually wear a large but the medium was absolute perfection, it hugs me in all the right places! Rated 4 out of 5 by Newfoundland1979 from Newfoundland Review Fits great 5'11 190lbs athletic body type had to use a combo L top and M pants. Movement great odor-resistant true Warm - not so much, obviously the mesh allows wind in and due to the fact we get cold Labrador wind. only due to the fact that it is breathable I would have called it a Mid-baselayer. Rated 5 out of 5 by Shanet from Great fit and warm Ordered the half zip on boxing day. The fit is amazing and keeps me warm at work. I received it shortly after new year's and have worn it everyday since. Great product I will continue to add to my icebreaker wardrobe in the future. Rated 5 out of 5 by ShariC from Outstanding product for base layer This is an excellent base layer, especially for men who tend to run hot - the vent panels allow additional heat to escape while still retaining the wicking ability with no stink! Rated 5 out of 5 by Kevjeans from Awesome I use this for running everyday in the winter. Awesome product very confortable.